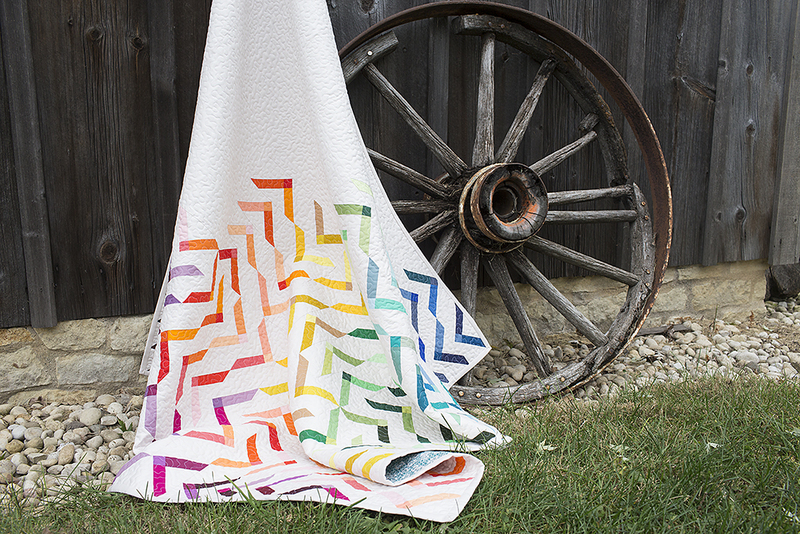 Make a 60 x 60 inch quilt with Denyse Schmidts's Modern Solids Collection. In the spirit of Denyse's book "Modern Quilts, Traditional Inspiration", the design should be inspired by – or be your own interpretation of – a traditional quilt pattern. Well if you know me, you know I love Denyse Schmidt, I love solids, and I love modern traditionalism! So it was a no brainer. I sat down with my favorite block anthology books, including Barbara Brackman's Encyclopedia Of Pieced Quilt Patterns. For those of you that are not familiar with this book, it is completely awesome. It is a hand drawn collection of hundreds (thousands?) 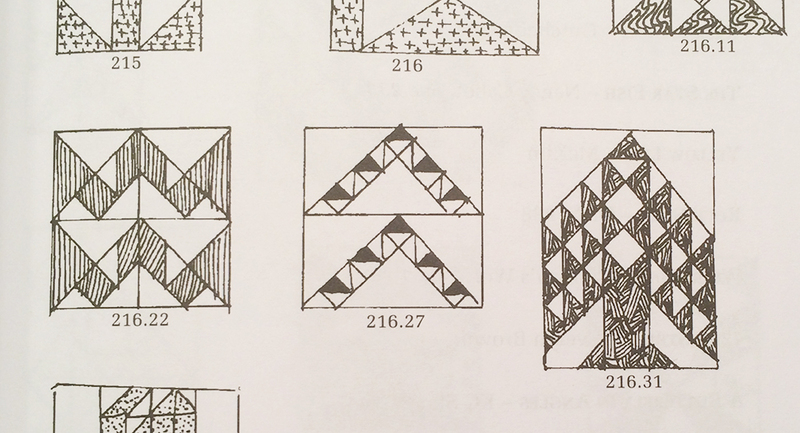 of historic quilt blocks and their source. There are no directions for making the blocks, simply drawings of the blocks themselves. I really was taken with Nancy Cabot's Spring and Fall quilt block (block 216.27 in this photo). I liked that it had the basic shape of flying geese blocks, not a 12" square. I also liked that it included some unexpected details with the tiny half square triangles inside. They were a bit too much detail for my personal taste though - but I really wanted to incorporate that concept somehow. I went about "modernizing" the block by taking that space and changing it to chunks of solid color. I selected colors for each block from the Modern Solids fat quarter box color families, giving them a really nice, dynamic look. For the quilt top layout, I alternated the direction of the blocks throughout the quilt, and incorporated a lot of negative space. I think it really keeps your focus on the design, without it getting too cluttered. I've made a quilt pattern for this design. I named it "Big Top" because they remind me of little tents. :) You can find the pattern in my shop. I've said before, this was a VERY friendly challenge. All of us participating know and respect each other. Everyone's quilts are so great! So go over and pick your favorite quilt that embodies the "Modern Quilts, Traditional Inspiration" goal. But trust me, it will be very hard to pick a favorite!